The simplest way to describe the content of Parade would be to think about it as being half scandal and half history, often with both in one story. War and crime stories feature repeatedly. The histories are histories told from the perspective of the coloniser: featuring stories of nation-building, ‘national character’ and fighting wars. Ref: Parade, December 1971, Auckland Libraries, 052 P22. For a contemporary reader some of the magazine’s contents and covers can be jarring. Race relations - Racism - Stereotyping. Ref: Parade, May 1961, Auckland Libraries, 052 P22. Was it of its time? 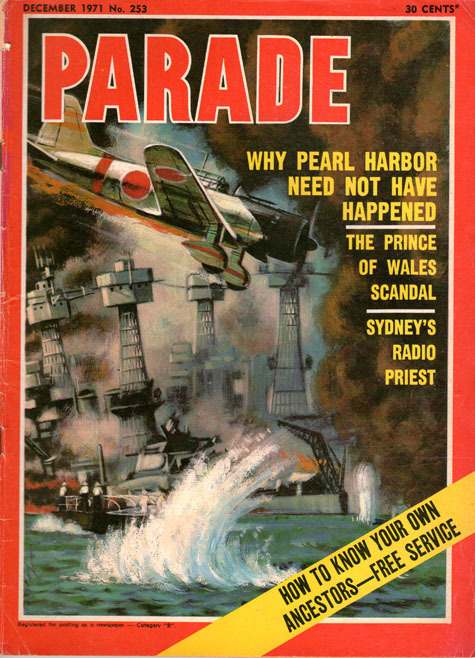 As a magazine about history Parade seems to sit outside of history. It contains little nostalgia for an idealised past and it seems to be wilfully ignorant of current events. Perhaps customers at the barbershop simply desired escapism. 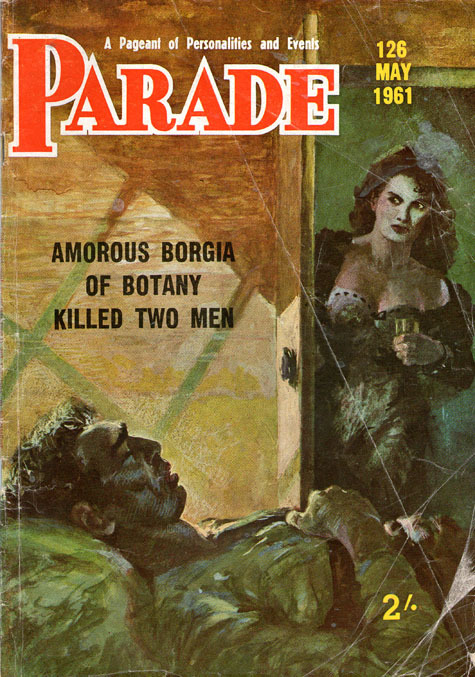 Some of the scandalous headlines include “The wildest wake that Sydney ever knew (June 1961)”, “NZ bloodbath (Dec. 1973)” and “Sydney’s opium dens (Feb. 1971)”. Historical stories include histories of Penfolds wine and the Holden family (Sept. 1973) and articles on the origins of the (English) place names in New Zealand and the Australian states. The ‘Know your ancestors’ feature in Parade commenced in January 1970 as a service to those interested in family history. Readers could forward queries to the editor and replies were published in the Parade. No other form of answer was given. The average length of this feature was three pages, which meant that many names of early pioneers were listed, together with important relevant details. Advice on sources and methods of research was also given. Responses to queries included the name and address of the inquirer which meant that other persons interested in a name could make direct contact. Ref: Parade, June 1977, p.56-57, Auckland Libraries, 052 P22. This service was conducted firstly by Charles Bateson, a well-known historian and author of The convict ships. Bateson also contributed a lot of articles to the magazine on historic topics. He was born in Wellington and spent his first 20 years in New Zealand and clearly retained an interest in New Zealand history. After Bateson died in July 1974, Lorne Greville, an experienced genealogist from Melbourne, continued the good work. Get birth/death/marriage certificates and other official documents. If the information required is pre civil registration go to the parochial records. And with very tricky/in depth questions they refer readers to the local branch of the Society of Genealogists. In 1981 Parade magazine: index to know your ancestors, 1971-1980 was prepared by Vera Cobden, a member of the Heraldry & Genealogy Society of Canberra. It consists of around 7700 entries and there is a copy of this available for researchers in the Central Library. I think seeing a family history section, which was very popular, in a barbershop magazine shows how interest in genealogy was growing through the 1960s and 1970s. Ref: Parade, March 1973, Auckland Libraries, 052 P22. In Family matters: a history of genealogy, author Michael Sharpe tracks the growing popularity of genealogy in the UK. From the formation of the UK Society of Genealogists in 1911 he says there has been steady growth over the past 100 years but points out that newspapers from the 60s and 70s regularly comment on the growing interest in family history research during that time. The release of the 1861 Census returns in 1962 meant by 1963 the Public Record Office (National Archives) was receiving over 38 000 visits a year. Some thirty years after it was first conceived, the National Index of Parish Registers (NIPR) was eventually published in early 1967 and in 1972 the 1871 Census was released on microfilm. Sharpe also acknowledges the importance of the ongoing Church of Jesus Christ of Latter-day Saints (LDS Church) microfilming work. The activities of the LDS Church proved a major impetus to the development of family history during the post-war period, both in Britain and the United States (and in Australia and New Zealand). This work continues today on a global scale through digitisation projects. The situation in New Zealand mirrored what was happening in the UK. Looking at the written research queries received at the National Archives it went from 118 of 367 (32%) in 1966, steadily growing to 57% in 1976. Ref: Parade, August 1977, Auckland Libraries, 052 P22. Thankfully this is no longer the case, but one thing librarians and archivists do wonder about is the continuing growth of interest in family history. Bateson thought non-indigenous Australians were inspired to become interested in their own origins by the bicentenary of Captain Cook’s landing in Botany Bay and sought to discover how their ancestors came to Australia. Popular opinion (and Wikipedia) points to the success of the television mini-series Roots igniting the public’s interest in their ancestors, but Sharpe’s book explains that it had been steadily increasing for the past century, aided by technological developments. Now we’ve also experienced the post-millennium family history boom fuelled by things like TV shows, the 1901 census (published online in 2003), network and digital technologies, and DNA testing. Do you have an opinion? Let us know in the comments why you think genealogy and family history continue to grow in popularity. Was Fred Bassett in it? What about the Phantom?